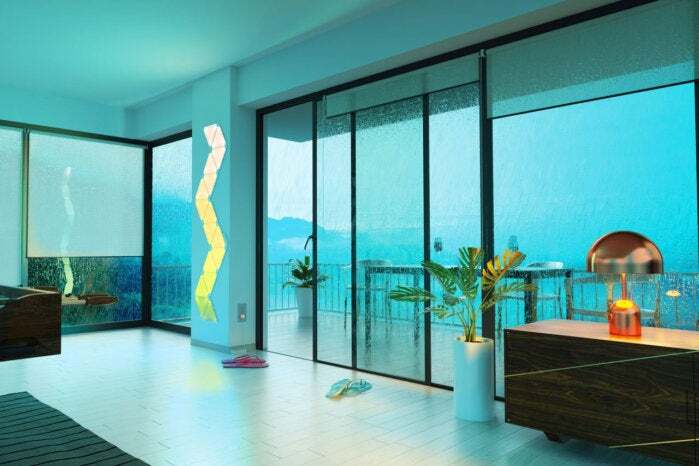 Some smart lighting solutions are designed to provide useful illumination. Nanaleaf’s Aurora is built strictly for fun. The whole affair couldn’t be simpler or much more obvious to use. The Aurora starter kit contains nine triangular panels (nine inches per side, which are bigger than you might think from the pictures) that fit together like a puzzle. Just slip a sliver of plastic (which looks like a SIM card) into one of the sides of a triangle and connect it to another triangle. Come up with whatever pattern of interconnected triangles your heart desires, then plug one of those triangles into a slim base that in turn connects to the wall. Presto, the whole affair lights up and begins cycling through a series of flashy, vibrantly colorful themes ranging from a glowing fire-like experience to a blue and white “snowfall” effect. Naturally, this is a smart device and a smartphone app lets you customize your own scenes, setting color and brightness, panel by panel. 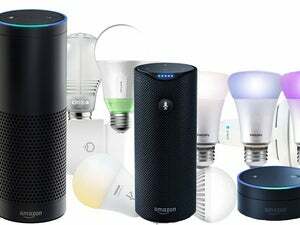 Much like a smart light, you can pick from a full color wheel of hues, or set up sweeps, fades, bursts, or any other number of effects. The obsessive inside all of us can easily get lost in this kind of thing for hours; but frankly, the Aurora’s beautiful pre-loaded scenes are hard to beat. A setup like this will run you about $700. Start saving now. 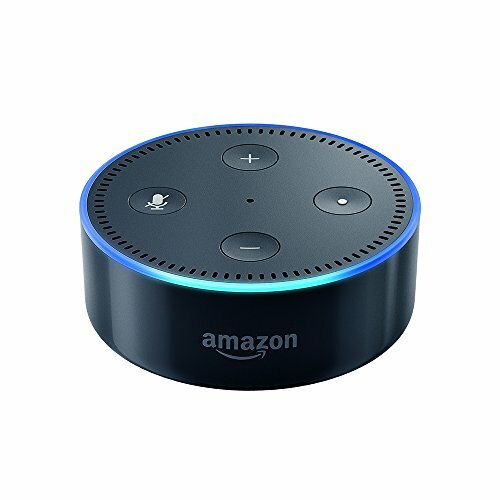 As a smart-home component, Aurora is both HomeKit- and Alexa-enabled. Functionally, this means you can tell Siri or your Echo to turn the Aurora on or off, or to switch the theme to something else. If you’re smart home-challenged, there are two small buttons on the base unit that let you manually turn it on or off, or cycle through all the scenes you have saved, one by one. 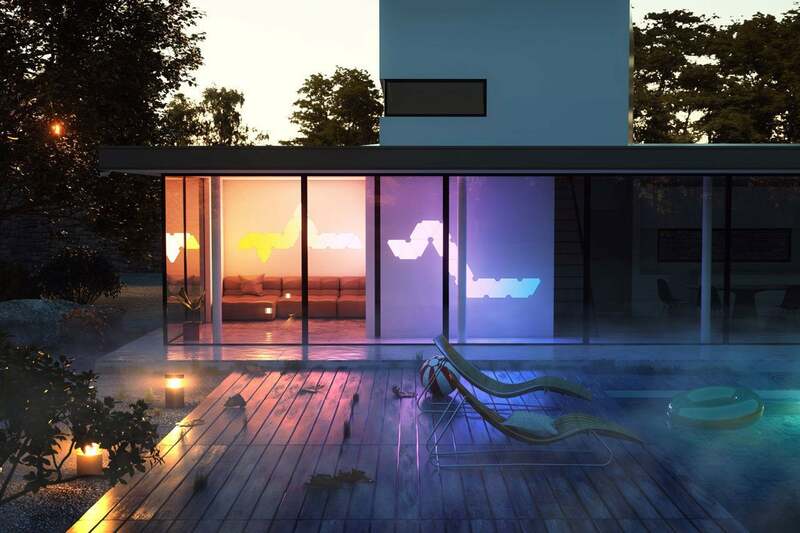 Nanoleaf also plans to offer a stand-alone remote control later this year. Again, Aurora is primarily built for fun, not for function, so don’t go looking for geofencing or SmartThings or Wink Hub 2 integration that would enable you set up a visual alarm (you can create IFTTT recipes, though). Heck, there’s not even much of a means to keep the panels stuck together—or even attached to the wall—aside from some sticky tape Nanoleaf throws in the box. No matter how sophisticated you get with your themes, keep in mind you’ll have a rather homely power cable dangling down off the wall, so plan accordingly. The Nanoleaf tiles connect and communicate with each other using these SIM card-like tabs. 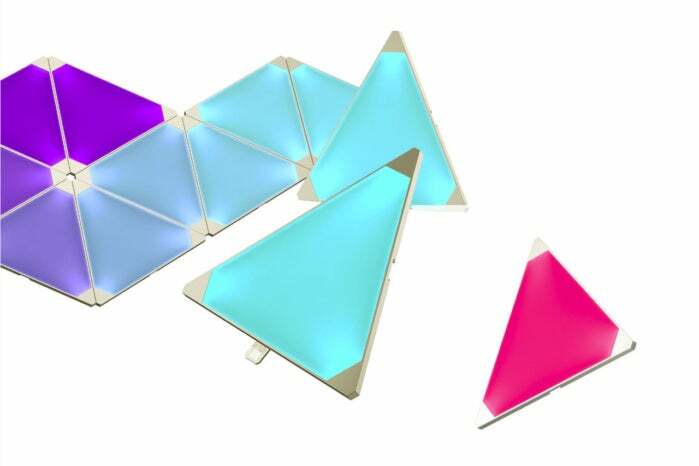 Is $200 too much to pay for nine plastic triangles that light up and make pretty patterns on your wall? I don’t think so, even if that money could go a long way toward proper color LED smart bulbs that you can actually read by. But hey, you’re either on board with this concept or you’re not, and if it sounds appealing to you, the best news of all is that you don’t have to stop at nine triangles. Pick up an add-on kit or two ($60 for three panels) and you can connect up to 30 panels in total per system.